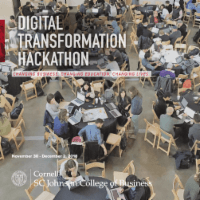 The Cornell University Healthy Futures Graduate Club is collaborating with the Cornell SC Johnson College of Business to host the Digital Transformation Hackathon. The Digital Transformation Hackathon will provide a creative, experiential learning opportunity for teams of students, engineers, designers, and entrepreneurs. The event will be held on the Ithaca campus November 30 through December 2, 2018.